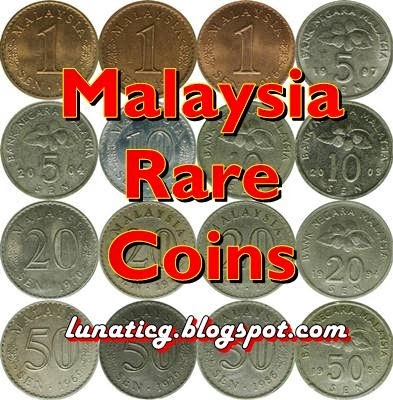 Do you know what is Malaysia rare coins or Malaysia rare key dates that most collectors are looking for? If you expect that their prices can go up for over 1 million ringgit, please don't read this post. You will be disappointed with the low price for rare coins of Malaysia. For all my collector friends. The word "rare" in here is not about rare in numismatic. Please don't message me and tell me that I wrongly used the words 'rare'. If you want to use that word 'rare' properly, can you give me one Malaysia coin that can be put as a rare coin? Last time when I were actively looking for coins in the flea market, I can still find Malaysia key dates coins with a reasonable price and high grade condition. Nowadays, it is almost impossible to find some of them in any flea market because they're many collector around. Malaysia 1 sen 1968 coin, only 10,500,000 approved mintage. Malaysia 1 sen 1970 coin with only 2,535,000 approved mintage. 1 sen 1970 coin were minted by Hamburg Mint, in Germany. Normal planchet for this coin is Copper but they're 1 sen 1970 Copper Clad Steel Pattern exist. So far, 4 known pieces has been traced, two pieces in Malaysia (One UNC,One GVF),One piece in Singapore,graded MS63RB and the last piece in oversea. You can read more about it in Sifu Dickson Niew post; 1970 sen Pattern Steel Clad Coin. For your information, this coin also have two different variety. Even though, they're over 21 million pieces of coins minted for 1 sen 1973, you can still find some extra value from coins made from Copper Clad Steel, normal coins were made from Copper. You only need to check them with magnet and if your coin stick to that magnet, that is the coin we are looking for. Normal 1 sen 1976 coins are made from Copper Clad Steel but they're few Copper planchet coins found by collectors and Steven Tan in his book wrote that less then 100pcs coins known to exist. On 27 March 2013, Malaysia 1 sen 1976 were Auction by Monetarium Singapore for SGD$2,600 (excluding tax and commision). The coin graded By Professional Coin Grading Service (PCGS) as Bronze: 1-Sen 1976 (KM1) PCGS MS65 RD. To learn how you can check for genuine 1 sen 1976 coin, you can read it in my post; How to detect 1976 1sen copper coin. Malaysia 5 sen 1997 coin, only 7,703,850 approved mintage. Malaysia 5 sen 2004 coin, only 11,520,000 approved mintage. I think almost everyone including non collectors already knew that this coins is one of the most sought after coins in Malaysia Numismatic. The 32,236 approved mintage is a mystery itself since Bank Negara Malaysia never give a very low mintage permission before. They are few theories why only 32,236 pieces were minted; Malaysia 10 sen 1971 coin story. When the story about 10 sen 1971 coin varieties came out, many people start to look for the 1st variety since most collectors don't have them. The price for the 1st variety is higher then the 2nd variety but it is not that easy to find the 1st variety. Many collectors still don't know how to check for the varieties and some are selling the 2nd variety as the 1st variety. Malaysia 10 sen 1994 coin, only 7,122,222 approved mintage. Malaysia 10 sen 2003 coin, only 8,640,000 approved mintage. With only 1,054,000 approved mintage by Bank Negara Malaysia, 20 sen 1970 minted by Hamburg Mint, in Germany is one of the key dates in Malaysia Numismatic. Malaysia 20 sen 1971 coin, only 9,958,419 approved mintage. Malaysia 20 sen 1978 coin, only 6,847,062 approved mintage. Malaysia 20 sen 1994 coin, only 2,680,339 approved mintage. Recently, we received news about 50 sen 1969 security edge sold for RM2,800 in Malaysia Numismatic Society Auction on 29 September 2013; Syiling 50 sen 1969 dilelong RM2800? On 19 October 2013, a 1969 50 sen Milled edge coin sold for SGD4100 or RM10,253 (including buyer premium) in Numismatic Society Asia (NSA) Auction at Landmark Village Hotel, Singapore and break the record for The Most Expensive Malaysia circulation coins sold in Auction. With approved mintage of just 2,000,000 and only few pieces were found to be Freak without security edge, any coins with an Uncirculated grade is a prize for collectors. They're also Milled Edge for 50 sen 1967 and 1968. Malaysia 50 sen 1979 coin, only 5,361,146 approved mintage. Malaysia 50 sen 1985 coin, only 7,115,162 approved mintage. Malaysia 50 sen 1986 coin, only 8,193,478 approved mintage. Malaysia 50 sen 1987 coin, only 7,696,117 approved mintage. Malaysia 50 sen 1995 coin, only 1,650,423 approved mintage.